The Bay Area is home to a wide range of bird species – thanks, in part, to our abundance of protected open spaces. Each bird has a unique relationship with the land, making their health a reflection of the entire natural community’s health. At POST-protected Cloverdale Coastal Ranches, for example, we are using birds to monitor the health of our coastal grasslands. Learning more about our local birds teaches us a lot about this landscape. 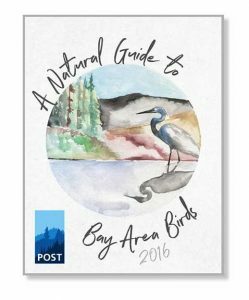 Which is why we are so excited to share POST’s new Natural Guide to Bay Area Birds with you. This guide to 14 local birds includes original illustrations from Obi Kaufmann, identification tips and fun facts. It has everything you need to deepen your knowledge and appreciation for our local land and sea birds. Download it today to take it with you on your next hike. To accompany your new guide, we’ve compiled the songs of these 14 birds here. These songs herald the seasons, captivate our imagination and bring music to the land.